Downtown Barrie: Thanks for joining us for our first #dtbarrietalks series. Let’s start the conversation by asking you “why Barrie”?! Grilled Cheese Social Eatery Are we talking metaphysically? Downtown Barrie: However you want to take the question. Really, what is it about Barrie that made you want to open the Eatery here? 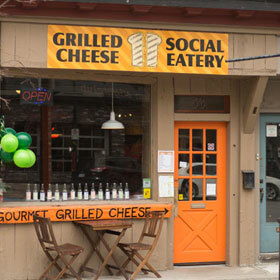 Grilled Cheese Social Eatery Probably because I like standing out and in Barrie I can do that, and be noticed. Downtown Barrie: You certainly do a good job of standing out! Downtown Barrie: Can you describe your perfect day in Downtown Barrie? Where would you go, what would you do? 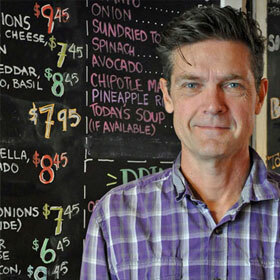 Grilled Cheese Social Eatery: Hmm let’s see – yoga, book, coffee, grilled cheese, movie, beer, dinner, music, wine. I’ll let you fill in the blanks. Grilled Cheese Social Eatery: When I opened the eatery I had very little expectations. No expectations – no disappointments right?! 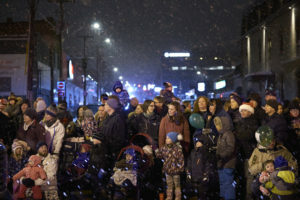 The community of people downtown that are concerned with how the City of Barrie matures is something I never expected. Downtown Barrie: What is your favourite place to snap a photo in Downtown Barrie? Grilled Cheese Social Eatery : The cliché answer would be at the base of the Spirit Catcher at sunrise! But I guess sticking with cliché I say anywhere I have my phone and I am enjoying family & friends. Downtown Barrie: We’d have to agree, it’s a pretty epic view! Downtown Barrie: That’s a great series! Can you elaborate more and tell us why you love that event? Grilled Cheese Social Eatery: It’s musical, super cultural, it has this random energy about it that I really love. And Brett & Chas are just great people that are truly invested in exposing local talent. Grilled Cheese Social Eatery I really try to get to anything and everything that is new ASAP, to say hello and have a bite. I still haven’t had a chance to check out Tian Ya BBQ or Bite And Go Italian Bistro though. Downtown Barrie: What should every Downtown Barrie visitor do at least once? 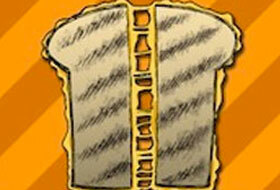 Grilled Cheese Social Eatery: Come to the eatery for a grilled cheese! 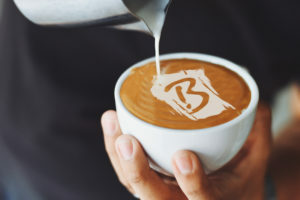 Downtown Barrie: How would you describe Downtown Barrie in one word? Downtown Barrie: What business would you love to see join the Barrie love train? 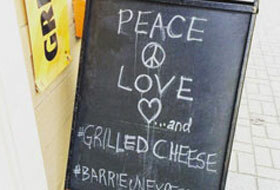 Grilled Cheese Social Eatery : Well, I like to think of it as more of a love bus. Speaking of buses, how about converting the bus station into a market place? So much potential. It’s time!! Downtown Barrie : Our last question is who would you like to nominate for our next #DTbarrietalks conversation? Grilled Cheese Social Eatery:I would love to listen to Scott from the Local Gastropub talk his version of Downtown Barrie speak! Grilled Cheese Social Eatery:You’re welcome, always. When will the next #dtbarrietalks happen? 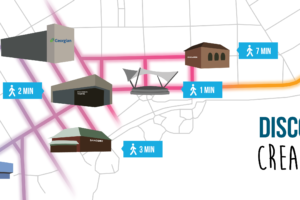 Downtown Barrie:Stay tuned for the next #DTbarrietalks conversation happening at the beginning of March!